I know this is nothing new in terms of suggestions. However it would be monumental for first person riders. Will future scripting allow us to make that happen? Would be nice to be able to bind it to the D-Pad. Re: Will scripting allow us to make a Look Left/Look Right Option? It's debatable what the best thing to do is. It's a little like "Punch Out" where you want to be able to see through the character sometimes. jlv wrote: It's debatable what the best thing to do is. It's a little like "Punch Out" where you want to be able to see through the character sometimes. If Jeremy made new FP JM's, with the current first person jm's, wouldn't you just essentially have to erase the shoulders to get it to work properly? Not sure what would be best. Probably want to remove most of the torso and upper arms. Going to be a little ugly no matter what. 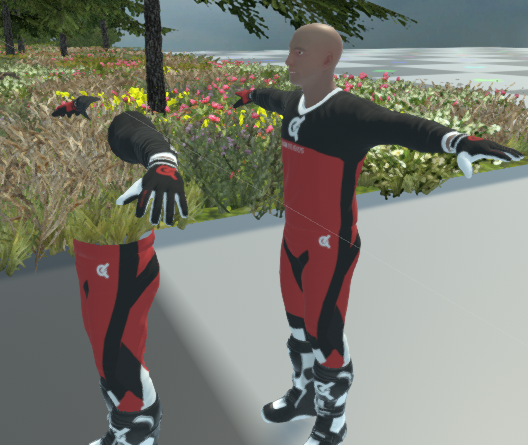 That's what we're doing in MCTD; toggling rider models for the local player, but using the third person model for all other clients. The first person model works well with our FP cam, but obviously, our cams are set up differently. The only problem in mxs using this solution would be converting all of the older user-made models to work with a new system. An invisibility shader using an extra b/w texture would be cool too maybe.